One of the most uplifting stories of the summer of 2002 was the miraculous "Nine for Nine" coal miner rescue in Somerset County, PA. Our cousin, Mark Zambanini, chief of the Sipesville Fire Department, played a key role in supporting the mission by making the fire hall available to the miners' spouses and families and and as a secure site for holding private briefings with Pennsylvania Governor Mark Schweiker. 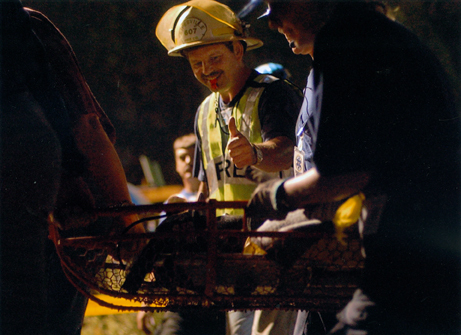 Seen here, in a famous photograph taken by the Associated Press, Mark gives a thumb's up to miner Mark Popernack who has just been rescued and is being carried away on a stretcher. Among other news media outlets, Mark was interviewed on CNN, Fox, KDKA-TV and in the Pittsburgh Post-Gazette. He and his wife Robin (Brocht) Zambanini were befriended by broadcaster Geraldo Rivera, and are mentioned in Andrew Morton's book, Nine for Nine, and in the Post-Gazette's book, All Nine Alive! Today they own Zambo's Country Cottage restaurant along Route 281 (New Centerville Road) in New Centerville near Rockwood, Somerset County. Robin is the granddaughter of the late Jacob and Minnie (Miner) Gary. This is one in a series of photographic images published on Minerd.com in 2007-2008 to promote our 2008 "Pittsburgh 250" reunion and to acknowledge the family's collective, long-term contributions to Western Pennsylvania as the city celebrates its 250th birthday. Be sure to see the profile of our reunion and website on VisitPittsburgh.com.